* Sept. 16th 2015 – Federal Election Debate on Energy, Climate and Our Future: Transition Sooke served as local host for the evening, the first in a series of five South Island debates presented by the BC Sustainable Energy Association and the Dogwood Initiative. * July 22nd 2015 – Climate Change Double Header: Presentation by Dr. Kumar Parvez on the effects of climate change, Mary Coll on the idea of a Food Shed and Mark Ziegler on the economic reasons for a Food Shed. * Feb. 24th 2015 – AGM and Video Night: 4th annual video night at Little Vienna Bakery, Sooke. * Sat. Oct. 18th 2014 – Election 2014: Voting for a Sustainable Sooke – A Transition Sooke Open Space Meeting, 10 a.m. to 4 p.m. at the Sooke Harbour House. * Sun. 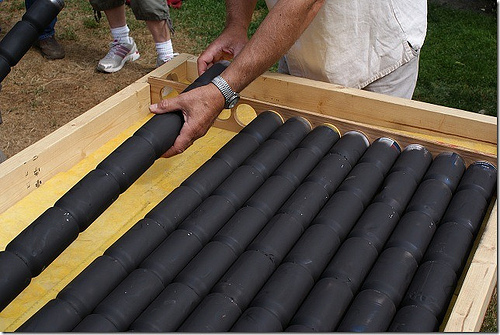 Oct. 5th 2014, 1 p.m. – Mason Bee Gathering at Yvonne and Dave Court’s home. Wonderful afternoon full with info on how to start your own mason bee colony: from the building of your bee “Condo” over the harvesting of the cocoon to the setting out of your new best friends. I will sure try it out next year! Interesting people, sunny weather, great hosts… It was a lovely day. Thank you Yvonne and Dave! Andrew Moore, co-founder of Transition Sooke and Program Manager for the T’Sou-ke First Nation’s internationally renowned solar power program. David Anderson, former Canadian Minister of Fisheries & Oceans and eloquent spokesman for the No Tankers/Pipelines movement in BC. * April 13th 2013 – Call for (Local) Action:Declare Vancouver Island a GE-Free Zone: a peaceful rally against GE food on Vancouver Island was organized by a group of local “activists” with help from, among others, Transition Sooke, Awareness Film Night’s Jo and ALM farm’s Marieka. This event was hosted by the Sooke Transition Town Society partnering with local economic and business organizations. * Nov. 4th 2012 –TRANSITION TOWN CAFÉ resumed on November 4th 2012 at the Reading Room Café in Sooke. Meeting on the first Sunday of each month between 2 – 4 p.m. these informal gatherings did continue into 2013. Transition Town Café,the first Sunday of each month, beginning November 4, 2012 Reading Room Café (beside Western Foods in Evergreen Plaza, 6660 Sooke Rd. ), drop in from 2:00 to 4:00 pm. Free admission. Food and drinks available for purchase. Are you interested in increasing Sooke’s resilience as a community? Not sure where to start? Let’s talk about how we can all help improve our community. The Transition Town movement began in Ireland but now spans the globe. This grassroots movement seeks to raise awareness of sustainable living and to build local resilience in the face of climate change, peak oil, and economic uncertainty. Sooke became an official Transition Town just over a year ago, but the work of transitioning to lower energy consumption and a more resilient community is just beginning. This is a movement based on inclusivity, on “we” not “us and them,” a focus in keeping with the new year and new leadership in our community. What is important is to find our commonalities and our mutual involvement in this global problem, not who is wrong or right. Synergy: connecting, building and creating. This is the type of activism that Transition Towns encourage, the kind of activism that promotes local businesses, local farms and gardens, and helps us pull together to be the kind of community we all want. Sooke Transition Town invites everyone to come on the first Sunday of each month, anytime between 2pm and 4pm. Drop in and chat with old and new friends. This is a great place to meet like-minded people for conversation, inspiration, and cooperation. The Transition Town Café welcomes everyone to join conversations that encourage us all to be the change we want to see right here in Sooke. 7 p.m. at the Edward Milne Community School theatre. Entry by donation. The movie is 66 minutes. 10 a.m. – 4 p.m. Thanks everyone! It was great! 5-00 p.m. after the Slow Food Cycle. Sold out and a marvellous success! * May 20th 2012 – Consensus Workshop: Members of Sooke Transition Town attend a Consensus Workshop organized by the West Coast Cohousing Group. 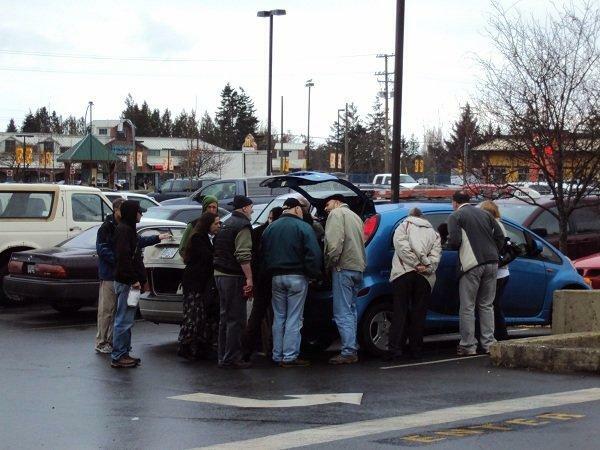 Volunteers are one of the most basic ingredients in any recipe for community resilience, and increasing Sooke’s resilience is what our local Transition Town society is all about. Did you know that 93% of volunteers do so because they want to make a contribution to their community? As the more than sixty people who have attended the first three Transition Café events know, these drop in gatherings on the first Sunday of the month at the Reading Room Café are a chance to discuss topics ranging from electric cars, to local economies, to food sustainability, to you name it. The May 6th Transition Town Café will feature a visit from Sheila Wallace representing the new Sooke Regional Volunteer Centre. The Centre is reaching out for input to determine the needs of the community. So come on out and share your thoughts. And we’ll be extending a special welcome to the knitters in the easy chairs this time! Drop in, free admission, Sunday, May 6, Reading Room Café (next to Western Foods), anytime between 2:00 and 4:00 pm. Attendees of the 2nd Sooke Transition Town Cafe had an opportunity to view the new Mitsubishi electric car. Participants enjoyed the tasty delights of the Reading Room Cafe and participated in discussions that swirled around a wide range of topics. 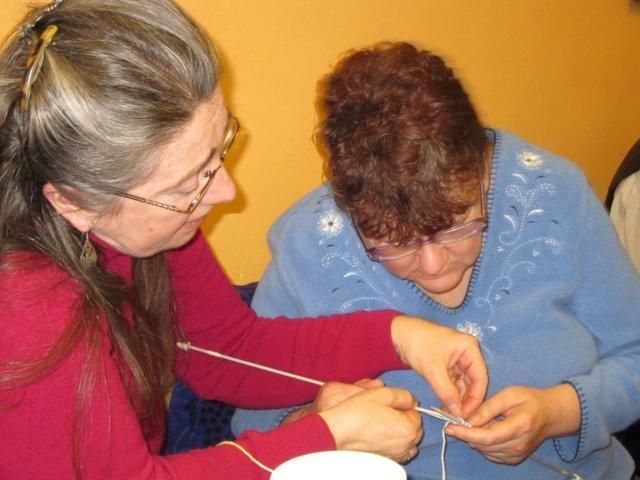 Included was knitting instruction for those so entwined! Dec. 4th 2011 – Cycling into Christmas. Members of the JDF Cycle Coalition and Sooke Transition Town escorted Santa and Mrs. Claus into town on Sunday, December 4th. 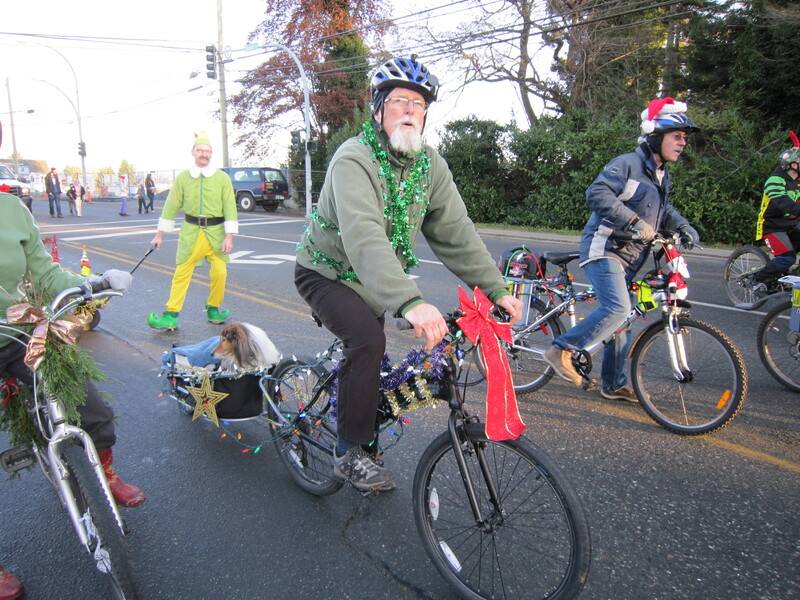 Lots of tinsel and other materials were available for participants to decorate their bikes and helmets before the humans and a four-footed accomplice hopped aboard for a 3 p.m. start to the Santa parade. The weather outside was anything but frightful, and the parade was delightful. How to encourage more sustainable living in Sooke is a major challenge facing a new mayor. Friday, November 4th at 7p.m. is your chance to find out how the two candidates plan to walk the talk of sustainability. Sooke Transition Town will host an evening with David Bennett and Wendal Milne in the Potlatch Room of the Sooke Harbour House. All candidates’ meetings offer an overview of issues and positions. An evening focused on just the mayoral candidates is a forum for an in-depth conversation about how to increase local sustainability. Sooke Transition Town is a group of concerned residents that works with other groups in Sooke — such as the Juan de Fuca Cycle Coalition, Food Chi, and the Sooke Slow Food Cycle — to raise awareness of sustainable living and to build local resilience. Resilience, a key to sustainability, is the ability of an ecosystem to withstand shocks. Local resilience in the face of climate change, fossil fuel depletion, and economic instability can ease the transition to less energy use, to more reliance on local goods and services, and to increased local food production. With sufficient planning and action, a mayor can encourage resilience and actually enhance the quality of life in our community while reducing our energy consumption. Each candidate will outline his vision for a more sustainable Sooke, then take questions. This public meeting is free and open to all. Saturday, September 10, 2011. Backyard Chicken Workshop, jointly sponsored by Food Chi and Sooke Transition Town. Hot, sunny weather added to the festive atmosphere at the Sooke Fall Fair and drew a crowd for the free Backyard Chicken Workshop under the tents in poultry area south of the Community Hall. Three twenty-minute workshops, beginning at 1:30 p.m. focused on bylaws regulating backyard chickens, arks for housing backyard hens, suitable poultry varieties, and hen husbandry. A local vet highlighted the importance of small, backyard flocks for ensuring resilience to poultry diseases. Thanks to all our volunteers for their expertise and hard work. Here’s a link to Volunteer Steve Holland’s hens at the Little Farm. Go ahead. It’s official. You can relax and enjoy the simple pleasures of life – friends, family, physical exercise. Research shows that once basic needs are met, more money does not make people happier. In fact, North Americans reached their peak happiness level in 1956 and it has been downhill ever since. Perhaps Sooke should follow the example of the little kingdom of Bhutan (and France, and the Province of Saskatchewan) and introduce a Happiness Index to measure how well off our residents really are? The Gross National Happiness index features in “The Economics of Happiness,” a lush, visually stunning, 2010 documentary that will screen May 11 at Awareness Film Night. Co-sponsored by Sooke Transition Initiative, the family-friendly film offers a refreshing take on the importance of local communities in shaping happy, healthy futures. Speakers from six continents include Vandana Shiva, Bill McKibben, David Korten, Michael Shuman, Juliet Schor, Richard Heinberg, Rob Hopkins, Andrew Simms, Zac Goldsmith, and Samdhong Rinpoche. A deep and pervasive positive outlook is what makes “The Economics of Happiness” so effective. The film does survey the grave problems that threaten globalized capitalism and make even its success seem like failure: income inequality, pollution, resource depletion and of course, depression and anomie. But from start to finish, this film presents a credible vision of a better future beyond economic growth. This is a vision of an eco-friendly future that’s desirable, where life is more about people than stuff and where the pace is slower and the intangible rewards — the only ones that contribute much to happiness — are great. The Economics of Happiness makes this vision believable by drawing on host Helena Norberg-Hodge’s lifelong love affair with the mountainous region of Ladakh, a tiny semi-autonomous kingdom in Nepal known as “Little Tibet” that until recently was largely isolated from industrial society. The price that the Ladakhis are paying for joining the global economy highlights the costs that affect us all. Is it possible to live a long, happy life with much less environmental impact? Yes, says this film and the Transition Town movement, which includes Sooke and Victoria as well as hundreds of other communities around the world. Transitioning away from reliance on fossil fuels and globalized economies and toward local resilience, including food security, can be more satisfying than the quest for endless growth. “The Economics of Happiness” offers a fresh, inspiring look at how increased reliance on local economies can bring prosperity not only to Sooke, but to every community on earth. In Helena Norberg-Hodge’s words, “When people start connecting the dots between climate change, global economic instability and their own personal suffering – stress, loneliness, depression – there is the potential for a movement that will truly change the world.” Connecting those dots is exactly what the Transition Town movement tries to do. After the screening, a panel will join Sooke transition initiators to discuss issues and opportunities that can make Sooke a happier place for everyone. “The Economics of Happiness” will be shown in the Edward Milne Community School Theatre Wednesday May 11 at 7 p.m. Admission is by donation. This will be the finale for the 2010-2011 season; Awareness Film Night screenings will resume in the Fall. Review. The Economics of Happiness website. Information about the Transition movement will be available in the EMCS foyer before and after the show. To find out more about Transition Town activities in Sooke, please visitsooketransition.org or email sooketransition@gmail.com. Friday May 13th. Two members of the Sooke Transition Town core team will be speaking about “senior cohousing” at Sooke Harbour House, May 13th at 7 pm. Senior Cohousing is an innovative approach to aging in place that combines private home ownership with the social benefits of community, the economies of scale of smart growth, and sustainable environmental practices. Attached is a poster for the May 13th evening where Margaret Critchlow and Andrew Moore will present an overview of the material they gathered at a Seniors Cohousing Facilitation workshop in California two weeks ago. 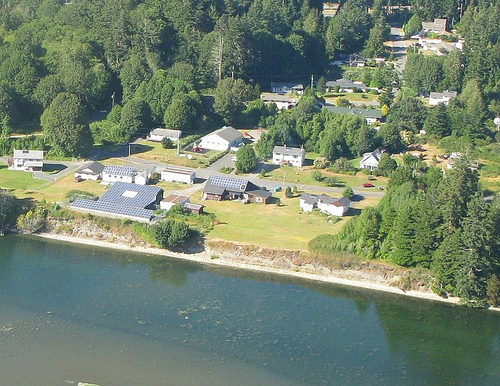 They are part of an informal group that has been meeting in Sooke for about six months to plan for possible senior cohousing in the Western Communities. A ten week study group on Active Aging in Community will begin May 26th, from 7 to 9 pm at the Reading Room Cafe. Please see attached e-flyer. This study group offers the opportunity to work through what aging in place can mean for you and to evaluate your options. By the end of the course you should have a clear sense of whether senior cohousing supports your personal vision of successful aging. Please pre-register for the study group as enrollment is limited (see details in the e-flyer). No need to do anything in advance for the May 13th event. Nitya Harris, Executive Director of Solar BC, will discuss how you can save money and the planet with solar hot water.